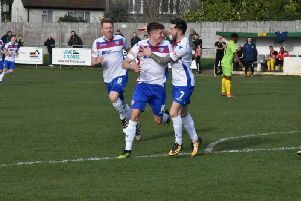 Andy Peaks was impressed with a second-half response from his AFC Rushden & Diamonds players as they claimed a 3-1 victory at rock-bottom Bedworth United. Diamonds had opened the scoring through Declan Rogers before the hosts levelled on the stroke of half-time. Bedworth were reduced to 10 men early in the second half and Diamonds took advantage as top scorer Tom Lorraine scored twice to wrap up the points and ensure Diamonds maintained their play-off push in the Evo-Stik League Premier Division Central. And manager Peaks felt his team were already showing good signs before they were given a numerical advantage. “We knew it was going to be tough because they are scrapping for their lives and they have picked up recently so we are delighted to come away with the three points,” the Diamonds boss said. “I thought we were a bit sloppy in possession in the first half and we overplayed at times because of the 3G surface. “I wasn’t particularly happy at half-time, especially with conceding the goal just before the break. We gave them too many opportunities that they didn’t work for. The victory sent Diamonds through the 40-point barrier, which Peaks had targeted to secure their status at the level for another season. However, he is now keen to ensure the season doesn’t “fade away” with Diamonds still right in contention for a top-five finish. “It was important to get the three points,” he added. “We have got some big hitters coming to Hayden Road in the next few weeks so we need these points on the board. “We are in a nice position, we are through the 40-point mark but we are in the mix.